If It's Too Loud...: Ben Kweller - "Heart Attack Kid"
Kweller spent some time battling depression following the near death experience. He has written about fifty songs, but didn't have any plans to release or record anything. His friend, producer Dwight A. Baker, convinced him to join him in a studio to at least try working on things. Luckily for all of us Ben Kweller is back with a new album, and we can check out the first single right now. "Heart Attack Kid" shows Kweller returning to straight up rock. There are some hints of his folk/country side peeking through, but "Heart Attack Kid" is just a fun rock song. As much as I love everything Kweller has put out, it's great to hear him rocking out with a fuzzed out guitar again. "Heart Attack Kid" has an unmistakable groove throughout, making this a perfect alternative rock song. You can listen to "Heart Attack Kid" below. Circuit Boredom, the new album from Ben Kweller, will be out later this year. 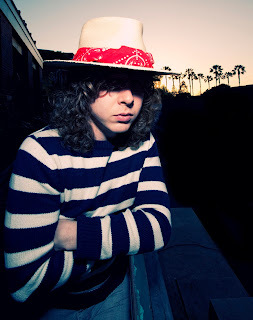 For more on Ben Kweller, be sure to check out his website.